Why doesn&#8217;t Indian media cover itself the way it scrutinizes others? Why doesn’t Indian media cover itself the way it scrutinizes others? 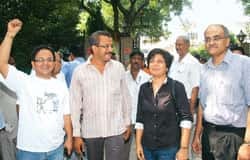 New Delhi: For the past few weeks, Indian newspapers have seen a steady drumbeat of media stories on a case involving four employees of Mid-Day tabloid newspaper and their legal woes. While the stories are newsworthy, what is little noticed—and even less debated—is how unusual it is for Indian newspapers to talk about their own, and to name names. That is because, industry observers note, there is often an unstated rule that prevails in most newspapers: media doesn’t write on media and media organizations won’t write about each other, either in praise or in criticism. Indeed, almost all Indian newspapers simply ignore news that is first reported by another paper or, if the news is of such magnitude that they have to follow it, a few of them credit generic “media" reports, rather than name the paper that first reported the story. Most skip giving any credit—or blame—in cases where a reported story is wrong and a firm has come out and told a regulator, such as the Bombay Stock Exchange, about the incorrectness of the story. 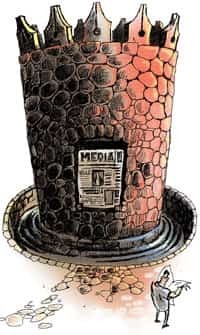 This general silence about its own is troubling to some observers, not just because of the traditional who is watching the watchdog issues, but also because the media industry, especially Indian print media, itself has become a huge business in recent years. “Now that so much of public’s money is flowing into the industry, media practices and organizations should be scrutinized like any other organization or sector," says Pramath Raj Sinha, until recently managing director and CEO of ABP Pvt. Ltd, which publishes The Telegraph newspaper and Businessworld magazine. Many Indian media companies have been listed on the bourses as part of an advertising and circulation boom—especially in print—raising money from capital markets as well as through private equity and venture capital firms. Meanwhile, India’s media landscape continues to transform and become even bigger. The Indian print and television industry, according to a report by industry lobby Federation of Indian Chambers of Commerce and Industry, and consultant PricewaterhouseCoopers, was at around Rs32,000 crore in 2006 and is likely to expand to around Rs75,000 crore by 2011. 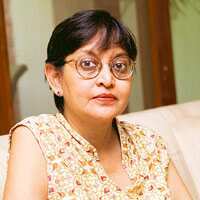 “It is rather ironical that media organizations like to believe that it is their duty to appraise and question other establishments, but when it comes to them or their peers, they maintain complete silence," says Meenakshi Madhvani, managing partner, Spatial Access, a Mumbai-based media audit firm, which helps advertisers measure the return on their media campaigns. It wasn’t necessarily always so. Two days later, TOI reprinted that piece on its editorial page, under the headline: “Look who’s stalking: firing stingers from their glass palaces." Through March that year, editorial pages of TOI, The Hindu, Business Standard and Hindustan Times, among others, were consumed with debate over a new agency—Medianet—that Bennett, Coleman & Co. Ltd or BCCL (publishers of TOI and other popular dailies such as The Economic Times and Navbharat Times) had launched, through which advertisers could buy editorial space. While other dailies cried sacrilege, TOI’s managers defended the agency, saying they were doing what everybody else does, too; they were merely being open about it. “My article," she says, “managed to get other media to talk about it openly. But today, when I see many papers, especially city supplements, I get the feeling the practice is widespread." “It (the scenario) is changing gradually, but there has all along been an unwritten understanding in newsrooms that you do not write about other media houses, especially critically," says Pradyuman Maheshwari, a former media critic for Mid-Day, best known for his website Mediaah! Maheshwari shut the site after a legal notice from BCCL alleging that he was indulging in slander and denigration. On 9 March 2005, Maheshwari declared to some 8,000 daily readers, “It’s just not worth it." Was Mediaah! defamatory? “Well, it carried language and insinuation that mainstream publications would not," says Ninan. Although media has proliferated, there still remain very few—or widely read—outlets for criticism in India. And, because they are isolated efforts, they have little critical mass. Ninan’s website, for instance, was conceived in 2000, when a group of journalists “came together to do something about the media," she says. “Nothing much happened because nobody was willing to risk their jobs by taking on the big newspapers." Today, Ninan says she operates the website from home with a monthly budget of Rs20,000, which comes from some foreign grants. While there are some niche journals dedicated to media reviews, such as Critique, a journal from Nagpur, and Vidura, published by the Press Institute of India, a not-for-profit, independent trust that professes to be working for sustaining high and responsible standards of journalism, these have been unable to gain wider recognition because of their inability to attract readers as well as participation from mainstream media. As a result, there is very little scrutiny of mainstream media when it comes to critically evaluating editorial decisions, reporting guidelines, practices of media companies and conduct of journalists. “Media enjoys certain privileges and wields immense power. So, it has an equal responsibility to be self-critical," says B.G. Verghese, columnist and a former editor of Hindustan Times and The Indian Express. “There are many issues that need to come under scrutiny—trial by the press, intrusive reporting, sensationalism, insinuations, to name a few. The question is, who watches the watchdog?" Sevanti Ninan says owners of media companies are reluctant to criticize each other, and this deals criticism a blow. “The problem is that they’re all pals, the proprietors," she says. “It’s a dog-doesn’t-eat-dog world." Outside India, especially in the US and in the UK, however, media reviews in mainstream press are often an accepted practice, with both individual titles covered for their journalism as well as their parents covered for business reasons. “Newspapers like The Wall Street Journal, Washington Post and The New York Times cover other media houses and their own just like they cover any other business, with specially assigned reporters," says Sreenath Sreenivasan, professor and dean of students at Columbia University’s Graduate School of Journalism, in an email interview. “These are high-profile, high-risk beats, but are critical to the readers’ understanding of what’s going on in the industry." But Indian media executives have a very different view on the issue. Some of them actually hail the tradition of media not covering itself. “Media not talking about itself is a healthy practice. It originates from respect for each other’s freedom for expression and point of view," says Ravi Dhariwal, chief executive of privately held BCCL, one of the largest and most profitable media conglomerates in the world. Besides, says Dhariwal, “If media organizations start writing about each other, it will lead to conflict of interests as organizations may use their platforms to settle scores with each other and this will hurt the credibility of the industry more." A top executive of a major TV channel says that for them, it’s a “damned-if-we-do-and-damned-if-we-don’t situation" when it comes to debating media and watchdog issues. Offering one recent example, she says: “We wanted to have a public debate on the government’s proposed Broadcasting Regulatory Bill on one of our chat shows, but then we decided against it after a lot of internal discussion because we thought the government or others might think we are trying to influence public opinion on an issue that concerns us." This senior executive, who works for a leading news channel, gave her response after discussions with senior editors at her channel, but insisted she didn’t want to be identified because of the “sensitivity" of the issue. Some outside observers, however, say that not wanting to talk about themselves isn’t about some higher principle, but actually about self-preservation. “Most media companies have things to hide. Be it the flouting of building norms or the illegal software they use. So it’s considered prudent to avoid a mud-slinging match," insists Maheshwari, now editor and chief content officer of I Media Corp. Ltd, which is part of media house Bhaskar Group. As a result, says Arun Chacko, director, Press Institute of India, “The reluctance to talk about competitors hampers criticism in the same way that it hampers reporting." Compounding its seeming inability to cover itself, most Indian newspapers also don’t have an open policy on acknowledging mistakes or misreporting. While it is standard practice in most papers in the West, few dailies here have clearly communicated policies on corrections or clarifications, preferring instead to wait for someone to complain and demand a correction. The Hindu has been an exception to the rule. “We follow UK’s Guardian newspaper’s model on corrections and clarifications, and code of conduct in our editorial practices," says N. Ram, editor-in-chief. “It puts a phenomenal pressure on the editorial team to bring out a quality and credible product." The Hindu appointed an ombudsman, or readers’ editor, in May 2006, who is responsible “to examine stories on parameters such as authenticity, integrity and adherence to the code of conduct," says Ram. “It has helped us gain a healthy balance in our work culture." TOI had appointed justice P.N. Bhagvati in 1988 as an external ombudsman, but the practice was discontinued after a couple of years. (Mint, which is published by HT Media Ltd, a listed company, runs a daily Corrections & Clarifications box on Page 2 that tells readers how to contact the paper about any errors. Mint has a stated policy of correcting all errors and its code of conduct, which governs the paper’s journalism, is available for readers at www.livemint.com). Correcting errors is an essential practice of journalism, says Byron Calame, who recently stepped down as public editor, or ombudsman, at TheNew York Times. “It is important for newspapers to have a policy for corrections," says Calame, who was also a former deputy managing editor of WSJ. “I believe the basic policy should be to correct all errors in a timely and ungrudging fashion." In addition to media’s own coverage, professional associations, such as the Society of Professional Journalists or Society of American Business Editors and Writers, and independent watchdog publications, such as Columbia University Graduate School of Journalism’s Columbia Journalism Review, play an important role in watching professional media practices, though they focus primarily on the US. Courses in media ethics are mandatory in most undergraduate and graduate journalism programmes in the West. In India, even well-regarded independent journalism schools, such as The Asian College of Journalism (ACJ) in Chennai, devote only a few lectures to the topic. “Most journalism schools in India are ineffective" when it comes to raising awareness of ethical conduct among students or working journalists, says veteran journalism educator Thomas Oommen, who runs the Manorama School of Communications in Kottayam, Kerala. “So the question of their having or even attempting to assume an active voice in issues relating to media ethics is irrelevant," he wrote in an email response to questions. “I do not want to give the impression that newspaper owners or managements are only partially to blame," says Oommen, who has led training at ACJ and prior to that at The Times School of Journalism, run by BCCL. “They are entirely to blame because they have made and continue to make little effort to improve the quality and professional character of youngsters coming into journalism." In India, “The Editors’ Guild issues professional guidelines and codes of conduct from time to time. But I’m not sure how much they are adhered to", says Verghese. “Self-regulation is important. If you don’t do it, the state will step in to regulate you." Despite its weak self-regulation mechanisms, most journalists and media owners in India argue that they don’t need government regulation and some say readers are the best judge of what a newspaper does. But, in a country where most newspapers are more or less given away for free, after factoring in frequent subscription deals and prizes, and actually sell for less than what a cup of tea costs at many of New Delhi’s street kiosks, readers may not necessarily have the influence in newsrooms as they are assumed to have by outsiders. Indeed, “Indian consumers, while loving the myriad choices they have now, are still not ready to pay for content," says Sinha, the former ABP chief. This means that if an outsider has a real influence on newsrooms, it is often advertisers working through the business side of a publishing house. Rahul Bhatia in Mumbai contributed to this story.